Green garlic are whole immature garlic plants, pulled off when the garlic crop is being thinned. They look like green onions or spring onions and are increasingly being grown as crops on their own rights. 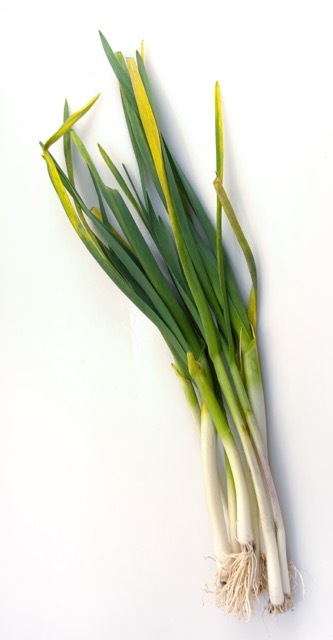 They have a stronger aroma and flavour than normal green onions but are milder than garlic. They should be used as garlic or green onions. To use them, the root end and any tough parts should be trimmed and the tender parts chopped or sliced and used as appropriate. Onion, leek or garlic can be used as green onions while still green and immature. Garlic has the strongest taste. Garlic belongs to the species Allium sativum, onion to the species Allium cepa and Leek, Allium ampeloprasum. Posted in Glossary, Ingredients, What is?Tagged Green Garlic, Immature garlic plants, What is green garlic?